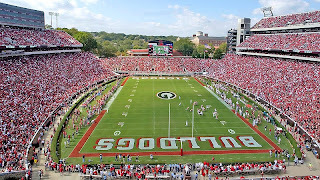 Georgia Sports Blog: College Pick'em Winner! Congrats to "C&C loves the dawgs." Special mention to "DawgRocker," who was second in points, but had the most correct picks at 122. C&C, get in touch with me at my gmail. The winner of the season pool traditionally gets to name the bowl pool. Thank you to everyone who played, especially the very few of you that are worse at this than me.